2) University of Helsinki, Finland. Tropical Peatland has been accumulated between the Rivers Kahayan, Sebangau and Katingan in Central Kalimantan during the last 10 000 years. Since the 1980s peatland and Peat Swamp Forest (PSF) is being opened by selective and illegal logging and destroyed by fires. Before then access to that area of peatland was possible only by boat. Since 1996 the Mega Rice Project (MRP) has inserted irrigation channels into the Block C and destroyed pristine PSF. Partly development took place by human settlements, agricultural cultivation and plantations, which have greatly increased the risk of peatland fires during the dry season. In 1997 and 2002 El Niño prolonged the dry season considerably causing additional risk of fire. With the help of Remote Sensing (RS) and a Geographical Information System (GIS) exact survey is possible, providing information as to the changes in the landscapes and the condition of the environment. An integrate planning and management program can be achieved. 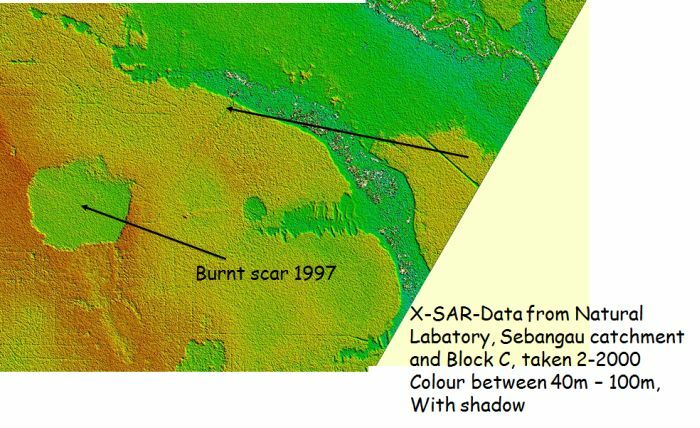 With the help of Landsat and SRTM DEM-X-SAR Satellite images (Shuttle Radar Topography Mission, Digital Elevation Model, Synthetic Aperture Radar) of 30m resolution in x and y and 5m in z-direction the topography of that area have been analysed from which the hydrology and carbon storage and emission situation can be estimated. Results of the peat depth combined with measured minerals below peat and its characteristics will be presented during the workshop and the estimation of carbon storage of that area.